Google has recently refreshed Pixel lineup with the release of Pixel 3 and Pixel 3 XL devices. Compared to the Pixel 2 lineup, the new ones sport larger displays, more powerful processor and improved camera. Pixel is a desirable phone since it always receives the best developer support. This is evident by the TWRP 3.2.3 official build coming within a month of Pixel 3 release. So, in this post, we’d like to highlight complete steps so that Pixel 3/Pixel 3 XL users can easily install TWRP 3.2.3 recovery on their phone. 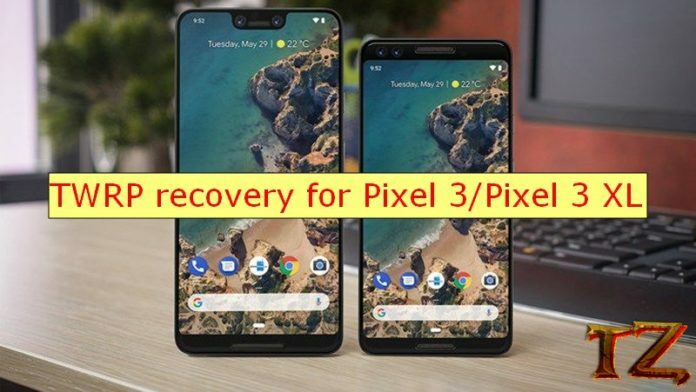 Here is the complete guide to installing TWRP 3-2-3 recovery on your Pixel 3 / Pixel 3 XL. However, before getting started, you should meet some requirements first. Make sure you have already unlocked bootloader of your Pixel 3/Pixel 3 XL. Return to Settings>Developer Options and enable USB Debugging option. Backup all the data on your phone since installing TWRP recovery will ease them all. Keep your phone battery at least 50% to make sure your phone will not shut down during the procedure. Once you have fulfilled all the requirements above, now proceed to the tutorial. Now, download both the img and the zip files of TWRP 3-2-3 recovery.